Students with an interest in criminal justice and science can excel in an online crime scene investigation (CSI) program. In these programs, learners gain the legal knowledge and technical skills they need to reconstruct crimes through forensic research. Upon graduation, many learners become forensic science technicians. Crime scene investigation offers growth that few careers today can provide. The Bureau of Labor Statistics (BLS) projects that jobs in this field will grow by 17% between 2016 and 2026. Graduates can also become detectives or fire inspectors, for which the BLS projects growth rates of 11% and 10%, respectively. Whatever route students take, they can enjoy careers that are both personally and professionally enriching. Florida State’s BS in crime scene investigation program prepares students to enter fields such as law enforcement, forensic science, security, and intelligence. The CSI program’s asynchronous format allows students to view lectures and materials and complete assignments at their own pace. Learners may also complete select lab courses in a week-long accelerated semester at the university’s Panama City campus. FSU’s crime scene investigator online degree requires 60 credits and incoming students must hold an associate degree from an accredited institution. All students must maintain a 2.0 GPA at minimum to graduate. The program includes courses for prospective crime scene investigators, such as crime in media, which covers how the media affects the attitudes and behaviors of criminal offenders, the criminal justice system, and the public. Students explore how news reporting influences policy and how public officials and members of society view crime. Florida State is regionally accredited by the Southern Association of Colleges and Schools. UMUC, located in the city of Largo, offers a 120-credit investigative forensics bachelor’s degree that prepares students for careers in criminal or civil justice. The program also helps ready individuals for bloodstain pattern analyst, and crime scene and latent print certifications. The CSI degree online program, which accepts up to 90 transfer credits, features courses on criminal procedure, medical investigations, fingerprint analysis, and firearms analysis. The programs cybercrime and security course offers an extensive exploration of computer-related and technology-related crimes, including state and federal laws and cybersecurity practices. While most courses in UMUC’s crime scene investigator online degree program take place online, students may take some classes in a hybrid format. All distance courses feature online textbooks and asynchronous schedules, allowing learners to complete their coursework at a personalized pace. Before starting the program, students should have some familiarity with lab work and procedures, including sample preparation and the use of microscopes. UMUC is regionally accredited by the Middle States Commission on Higher Education. Liberty University offers a faith-based education and online degrees in almost every industry. Liberty’s mission is to develop Christ-centered men and women with the values, knowledge, and skills essential for impacting the world. Most degree programs are 100 percent online. Every program meets the same rigorous accreditation standards as the residential degrees offered on the Liberty University campus in Lynchburg, Va., and emphasizes a balance between theory, research, and hands-on training. Notable programs include Liberty’s online Social Work, Substance Abuse Counseling, and Criminal Justice Bachelor’s Degree programs. Liberty University is accredited by the Southern Association of Colleges and Schools Commission on Colleges. Many of its programs also hold accreditations, including those from the Accreditation Board for Engineering and Technology, the National Council for Accreditation of Teacher Education and the Commission on Collegiate Nursing Education, among others. Founded in 1971, National University is the second-largest private, nonprofit institution of higher education in California and among the largest in the United States. The University offers approximately 120 undergraduate and graduate degree programs covering a wide variety of subjects, including Business and Management, Health and Human Services and Criminal Justice. Programs and information are available at campuses throughout California and Nevada. Students outside of those areas who are interested in pursuing a degree online can find program information, gain educational counseling, and apply for admission at National University locations in Georgia, Florida, Nevada, Texas, Virginia, and Washington. More than 70 programs are available online, enabling you to pursue a National University education from anywhere in the world. National University is regionally accredited by the Western Association of Schools and Colleges (WASC). Founded in 1854, Columbia College is one of the oldest women’s colleges in the United States. A private liberal arts women’s college in Columbia, South Carolina, today Columbia College offers both undergraduate courses for women, and co-ed evening, graduate, and online courses. Columbia College offers a number of flexible online degree programs, including Criminal Justice, Disaster and Emergency Management, and Nursing. Columbia offers both graduate and undergraduate degree programs online, and allows for up to 90 credits for transfer students from regionally accredited colleges or universities. Columbia College is regionally accredited by the Southern Association of Colleges and Schools Commission on Colleges. Note: Salem University is a for-profit schools. If you have any questions about for-profit schools, check out our Guide to For-Profit Colleges: What You Need to Know. Salem University is a for-profit college located in Salem, West Virginia, with about 1,835 students enrolled in its undergraduate and graduate programs. Founded as Salem College in 1888, Salem College began as a small institution, drawing students mainly from a limited area. In 2005, Salem Education LLC assumed control of Salem and began strengthening the university’s programs and operations, developing new programs of study, and improving the university’s facilities and infrastructure. Today Salem University offers undergraduate degrees in Biology, Business Administration, Computer Science, Criminal Justice, Education, Information Technology, and Nursing. Graduate degrees and certificates are offered in Business Administration, Education, and Nursing. Programs and courses are offered on campus, via distance education, and blended. In 2017, the name of the institution was changed to Salem University. This change reflects a desire by multiple constituencies, including students, alumni, and community members, to honor our West Virginia roots, history, and heritage. Salem serves the educational needs of an increasingly diverse, global citizenry and welcomes students from around the world to join our community of scholars. Salem University is regionally accredited by the Higher Learning Commission. Saint Leo University, a non-profit, private, Roman Catholic, liberal arts university established in 1889, enrolls more than 15,900 students. Saint Leo University awards a variety of undergraduate and graduate degrees and serves students of all faiths through six eight-week terms each year. Saint Leo University Online offers a host of associate, bachelor, and master degrees which students can earn 100 percent online. The degrees are the same as those earned by traditional on-campus students. Online degree offerings include five associate’s degrees in business administration, Criminal Justice Bachelor’s of Criminalistics Degree, information technology, cyber security, and liberal arts, as well as 20 bachelor’s degrees in health care management, religion, sociology, and more. Saint Leo University is regionally accredited by the Southern Association of Colleges and Schools Commission on Colleges. Colorado State University–Global Campus, the online campus of the public Colorado State University System, specializes in programs for adult professional, non-traditional students. Founded in 1870, Colorado State University (CSU) has a long history of quality education. CSU established its Global Campus in 2007, offering students a flexible and convenient method of earning their degree. CSU-Global Campus' classes begin every four weeks, and most courses follow eight-week terms. CSU-Global Campus offers a number of leading online programs, including their Online Bachelor’s of Criminal Justice degree. Colorado State University Global Campus is regionally accredited by the Higher Learning Commission. Prospective students should carefully research their options before choosing a CSI program. Courses often include subjects like fingerprint analysis, criminal procedure, and crime scene photography. These courses prepare students to serve integral roles in the criminal justice system. Degree candidates learn to collect and analyze crime scene evidence without contaminating it. Some universities offer specialized courses and concentrations such as cyber forensics or homeland security. Learners who want to excel in specialized careers should ensure that their programs will help them develop the required skills. Even when schools do not have individual plans for these concentrations, students can tailor their degrees by choosing electives relevant to their interests. Degree candidates should also choose schools that have accreditation. Institutional accreditation demonstrates that the university passes rigorous scrutiny of their academic standards. Employers and other schools recognize degrees from such institutions, but may not respect diplomas from other schools. The costs and lengths of programs should also factor into these choices. For example, learners who already hold associate degrees may choose bachelor’s programs that accept the majority of their credits. 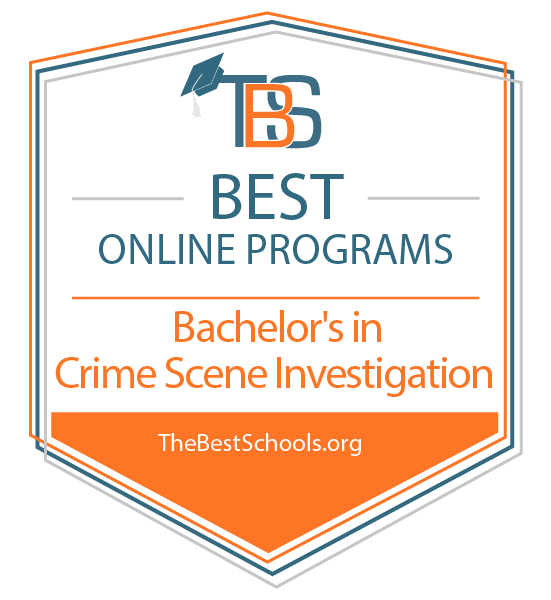 What Else Can I Expect From an Online Bachelor’s in Crime Scene Investigation Program? Each CSI degree is unique. For example, some have concentrations that allow students to specialize in a given area. On the other hand, a CSI degree online can be a concentration within a criminal justice program. However, several classes are standard in these plans. Although the names may vary, most forensics bachelor’s students take the courses named below. These courses help teach students the technical skills they need to take accurate and informative images of crime scenes. Graduates use this knowledge to interpret photographs and manage investigations. It takes critical thinking, management, and resource oversight skills to manage a crime scene. These classes give degree candidates the ability to supervise the first crucial hours of an investigation. Forensics students learn how the justice system uses evidence throughout investigations and trials. This insight helps degree candidates know how to collect evidence for this purpose adequately. Fingerprints can be crucial to finding criminals. However, professionals must collect and analyze the samples correctly. These classes give learners the tools they need to use fingerprints to identify people. When criminals use guns in their offenses, investigators must identify the firearms. In these classes, degree candidates gain the technical and analytical skills they need to perform this task. A crime scene investigator online degree can lead to several different careers. Many graduates become forensic science technicians who collect and analyze crime scene evidence. People with this degree can also be private detectives or fire inspectors. Many crime scene investigation careers are great for professionals with excellent analytical skills. These skilled professionals go to crime scenes to collect photographic and physical evidence. Then they use laboratory equipment to analyze the clues. These workers then provide investigators with reports of their findings. Because investigations and trials rely on these technicians, many employers require candidates to have at least a bachelor’s degree. When private citizens want answers, they can turn to private detectives. These professionals analyze evidence, track suspects, and report their findings to clients. A bachelor’s degree can help make these investigators more marketable and prove their expertise. They must also be licensed to work in many states. Fires often leave behind unique evidence that is difficult to interpret. As such, many jurisdictions rely on fire specialists to investigate these instances. Fire inspectors determine if flames were accidents or the results of arson. Furthermore, they enforce building codes that help keep people safe from fire.